The Eucharistic Congress Bell arrived in Emly on Saturday evening. The bell is being carried in pilgrimage throughout the country as part of the preparations for next year’s International Eucharistic Congress which is being held in Dublin. The ringing of the bell has always been associated with a call to prayer. On arrival in Emly the bell was firstly carried by parishioners through the local cemetery remembering our dead and their contribution to our lives and our parish. The bell was then installed before the altar in the parish church and remained there during Saturday evening’s Mass and the 9am Mass on Sunday morning. 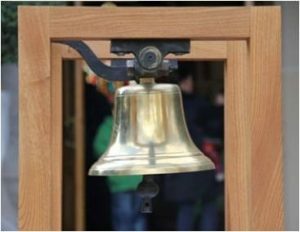 The bell then continued on its journey of pilgrimage in the Archdiocese of Cashel and Emly where it will remain for this week.